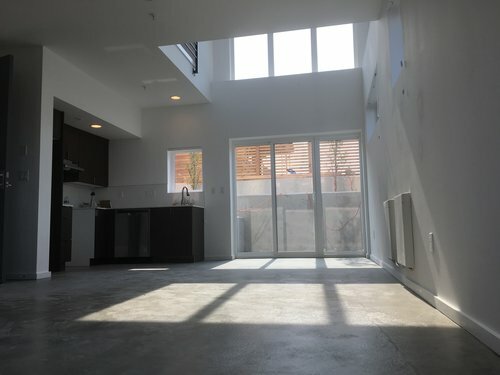 Sunny, unique two-story loft apartment on the ground floor with a small private patio. This showcase unit has a double-high ceiling and heated concrete floors in the kitchen. There is a sweet window above the sink in the L-shaped kitchen, a large living area and vinyl plank flooring upstairs. It is flooded with light from south and west facing windows. People-watch the daily flow of Rail Riders. Contemporary faucet with pull-down sprayer in the kitchen, mod stainless steel sink and garbage disposal. Stainless steel dishwasher and fridge. Energy star appliances including washer dryer. Large tile shower and vessel sink in the powder room. The floor plan above is for the ground floor with adjacent small private patio (not shown). The floor plan below is the same unit's second story bedroom loft.